Fast delivery, Top quality, excellent product. Recommend highly!! Received Bag no problems. Good Quality. Good Service. 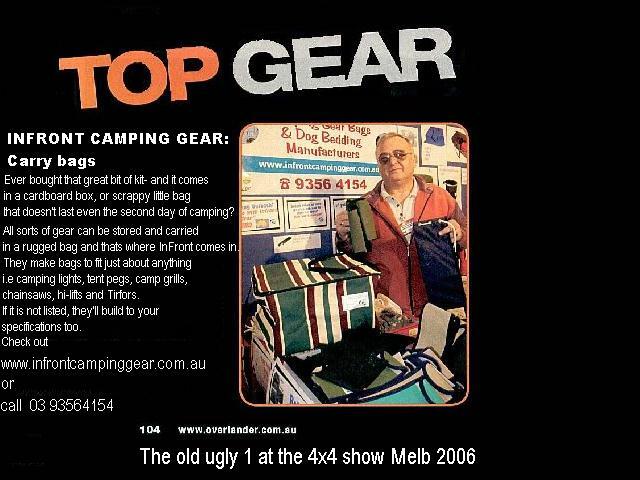 Just thought I'd pass on my recent experience with In Front Camping Gear. I purchased a canvas rear wheel rubbish carrier from them sometime ago for a realistic price (unlike some of the others out there) and I had a problem with 1 of the buckles. Klaus from In Front was extremely helpful in getting it fixed. They have some great stuff, inclusing a very useful collapsable canvas bucket which I think has got a mention here before. If you need any canvas stuff - check them out. Great pricing and Klaus stands behind his products (which is becoming increasingly rare with companies these days). Usual disclaimer - I have nothing to do with them other than being a very satisfied customer. I had bought a Porta Pottie bag from Klaus, and the handles broke on a recent trip. I contacted him letting him know what happened and he sent me a new one without hesitation. And, as you said - his prices are very good. Do they have an address or are they online only? I started looking around and then had server probs so couldn't locate the info I was after. Stuff seems a very good price. If God didn't want us to eat animals, why did he make them out of meat...??? online only I think. The website is a bit clumsy, but it does have a search function that makes it easier to find what you want. In Front Camping Gear link ... here . I've got the canvas rubbish bag, 4 canvas clothes bags, and 2 canvas camp oven bags, as well as a HUGE dogs bed...it's great stuff and reasonable prices, and they're customer service relations are fantastic. They also have their stuff up for auction on ebay as well. My rubbish bag was returned in 2 days, repaired, and enclosed with it was a $10 note from Klaus to cover my expense in posting it to him for repairs (which was actually more than the cost of postage in the first place). Through-out the process he kept me informed by email. It is the best after-sales customer service I have ever received. Good on you Klaus - you have made my day. I only wish other businesses shared your commitment to their products and customers. Just to let you know both performed magnificently. 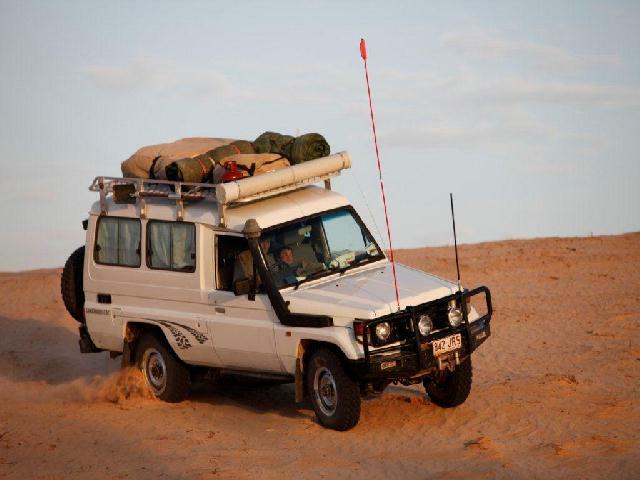 The tyre bag doubled as a storage area for light weight bulky gear and airbag lift jack. Both bags were soundly sealed, which was especially important for the main RR bag. In 3 weeks of constant camping & travelling, not once did any sand or dust enter the main RR bag whilst in transit, so contents remained dust free as well as dry and tidy. I've got another made to measure request, I need some more bags and in one in particular to house a camp oven with a hillbilly folding fry pan inverted on top. Just checking first to see if you can make a Camp oven bag that is a combination of the measurements of your Large & XL bags. If possible can you make a bag that is 15" (380mm) x 9" (230mm), and if so, how much would the price be?